I've been living a two-pug life now for over a week and am loving it! As you know from my last post "Introducing The Newbie - Rosy!" I adopted a 2 year-old pug. She is so different from Sunny - full of mischief and energy! She's also obsessed with me and will cry when I leave her, even when I shower. I now just leave the door open and she squeezes her face in between the wall and the shower curtain and blinks as the water mists her face. While it was a bit difficult at times between Sunny and Rosy, they're slowly working things out and are getting along better each day. I try not to get too involved with their hierarchy tiffs so that they can settle things themselves, but I did have to break up one fight (no more yummy chews for a while). As I've observed their interactions I've noticed a certain set of rules that have been evolving between the girls. 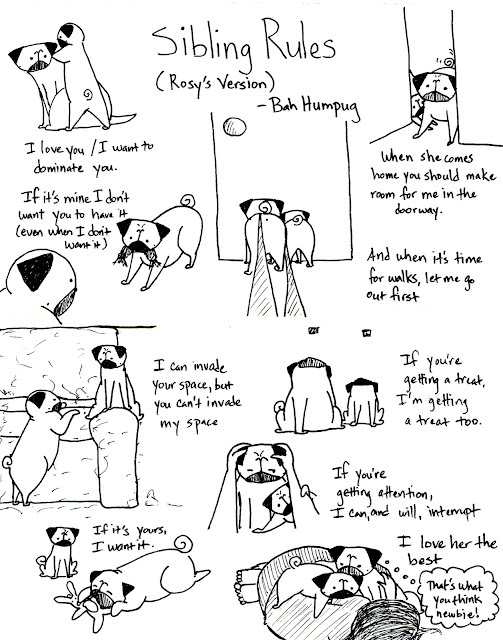 So here are a few from Rosy's point of view. Got yourself a dominate little miss, didn't you! 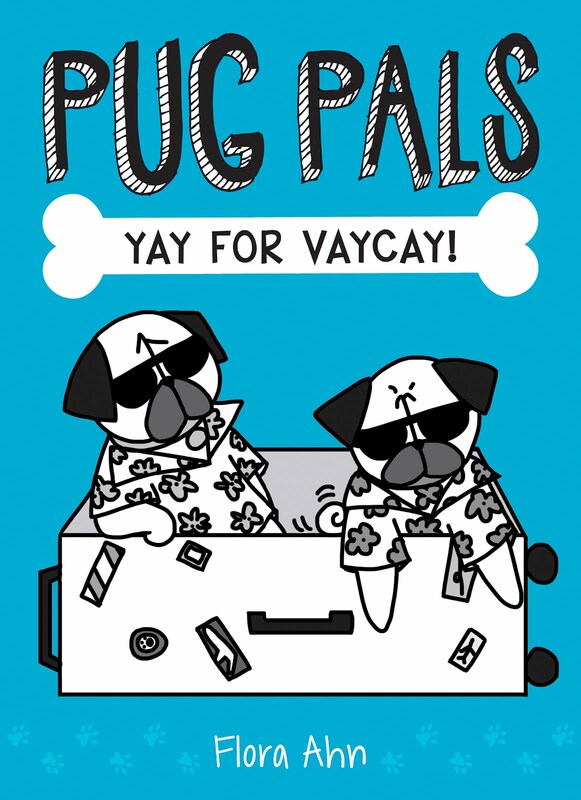 Glad you're enjoying two pug life! I am dying of the cute right now. Rosy seems more like Knightley... he's a rambunctious, attention-hogging little tyke. I think maybe it's good to have one dominant/one more submissive dog! Love the drawings!! OMG, this is perfect! I have a 4 year old pug and last year got a pug puppy. Today's strip is a great description of their relationship. Noodles just got a sister pup (a maltese mix, 4 months old). The above is so true of their relationship but add that my previously non-playing pug is now happily frolicking all over the house and yard. I think Rosy is more like my Lily. But you really nail it with their actions. My Jemma is more like Sunny. Then there is poor Maddie in the middle trying to figure it all out. So perfect! Even though our "new" pug Rosie is older, she does a lot of these things too! She loves to dominate and will often push Bowie out of the way if he's on my lap, so she can take his spot. 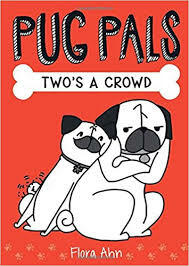 Love the crazy pugs!